A small volunteer group tackling a big stray dog problem in Houston’s impoverished neighborhood found itself unexpectedly in the limelight after one of their photos went viral. The main question was, she wrote, why she didn’t pick the dog up. And that question goes to the heart of the problem. This dog is in relatively good condition and sadly, when people see a dog in this shape they are less likely to step up to foster. The volunteer project is called Forgotten Dogs of the 5th Ward. 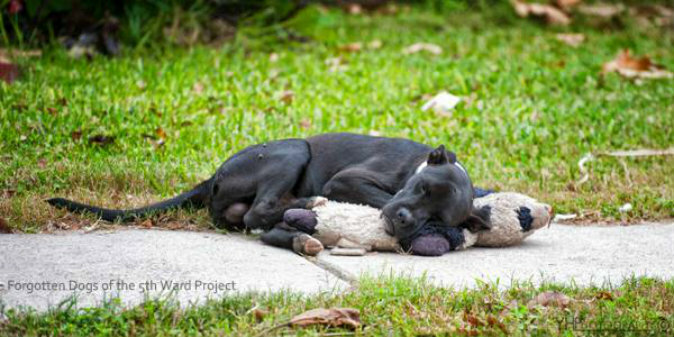 5th Ward is a low income neighborhood in Houston with a long term stray dog problem. The project has about dozen “core volunteers” who go out and feed the strays, vaccinate them, deworm them, and help them find foster homes. They also educate locals about pet care, help them get medical care for their pets, and even give out vouchers that cover rabies vaccinations. Sadly, that is just not enough to manage the problem. There seems to be no estimate available on how big the problem is, aside from one estimate the city released years ago putting Houston’s stray dog population at around 300,000. Yet Houston Chronicle columnist Ken Hoffman found out last year the city’s Bureau of Animal Regulation and Care doesn’t have enough money to conduct a survey so the number was an estimate. It is not clear what the estimate was based on. The 300,000 figure seems to be unrealistic, as it would put some 500 stray dogs on every square mile of the city, including the many “well-maintained, patrolled” neighborhoods, where there are virtually no stray dogs, Hoffman noted. What the 5th Ward volunteers know is that they can come across 40-60 strays in a matter of hours in their area. They can feed about 50 of them during each of their rounds and perhaps for one of the dogs they can find a new home, Holzbach wrote. That’s why they focus on the ones in the worst condition and that’s why Holzbach didn’t pick up the one hugging a teddy bear. “This dog is in relatively good condition and sadly, when people see a dog in this shape they are less likely to step up to foster,” she wrote. But the good news is, this picture sparked more that just questioning. Since media picked up the story, the Forgotten Dogs of the 5th Ward Project received a flood of support. “Friends, we want to say we have been humbled by the number of offers to help and inquiries about our group that we have gotten the last several days,” a March 24 post on the group’s Facebook page reads. A day earlier, the volunteers set out again to look for the teddy-hugging dog. They met a 89-year-old man called Calvin who said it was his dog, as well as many other strays he’s picked up and cared for over the years. He said the dog wouldn’t stay contained and kept jumping the fence and some time ago the dog disappeared. “Since he was not neutered, the chances are very high that he ran off after a female in heat,” Holzbach’s Facebook post reads. And so we may never get a closure on what happened to this particular dog. Hopefully his story can help others thanks to the awareness it raised for the (now-not-so-)Forgotten Dogs of the 5th Ward. Holzbach however, seems careful with optimism. “This morning we posted a mangy dog and out of the 18,000 followers we have we had one potential [adoption] offer. And unfortunately that is what we are faced with on a weekly basis,” she told us.